Have you cleaned your carb lately and now your engine tends to sudden stalling when you open the throttle too fast? Is the fast idle now way too high (5000 u/min and more)? Then you have probably fallen into a booby trap which is not mentioned in the Honda manual – and to make things worse, the manual is even dead wrong in that matter. The manual seems to suggest that the accelerator pump (ACP) is adjusted with the adjusting screw (nr 2) shown in the pic. I never understood how that’s supposed to work since that would only change the fast idle speed. 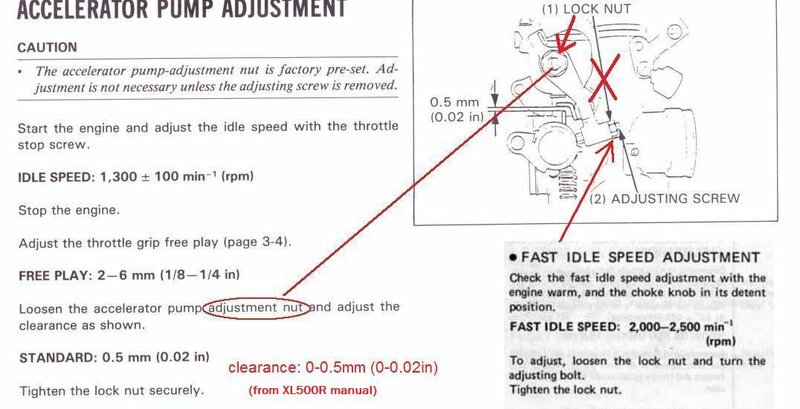 And sure enough, that’s exactly how it’s described in the XL500R manual (the XL got the some carb). The ACP adjustment lock nut is actually nr1 in the pic. If you loosen that nut you can turn the lever arm to achieve the mentioned clearance. And the second blunder: I had several carbs that had issues with sudden stalling with a clearance of 0.5mm. In the XL500 manual is given a range of 0-0.5 mm, so when I decreased the clearance, the stalling was gone. And since the fast idle adjustment is also depended on the ACP clearance it explains the way too high fast idle speed after carb disassembling.